First of all, I would like to thank my friend Ming of Bentomonsters for getting me some super cute Disney themed picks when she went on vacation to Disneyland Tokyo. Both of these lunches are so easy to put together. The first one was stamped with a Smile cutter which I purchase from a dollar store few years ago. The second lunch was spruced up with a couple of cute picks. 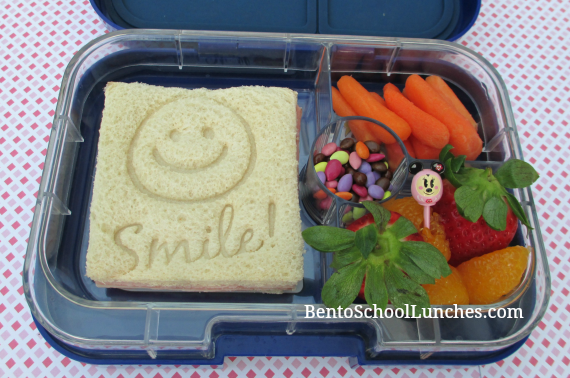 These lunches were packed in a Yumbox Panino. Main compartment: Smiley face stamped on a sandwich. Center: Choc covered sunflower seeds. Top right: Organic baby carrots. Bottom right: Strawberries and mandarin orange segments. Main compartment: Cheese bread slices, organic ham roll-ups with a couple of picks. Bottom right: Seedless black grapes and apple slices. Here are the supplies or similar that I used to create and pack these lunches. Both of the lunches look yummy and simple!! 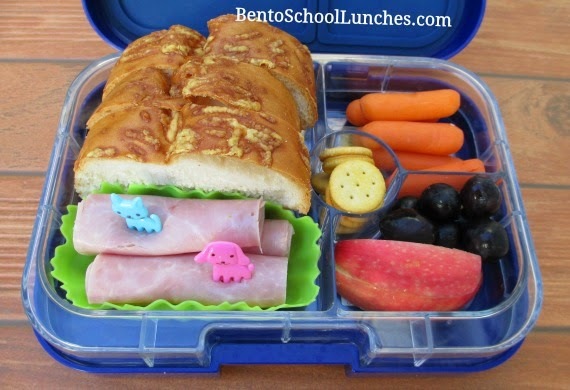 Cute and yummy bentos! The Disney pick is adorable! They both look good! Glad you like the picks! I only allow my boys to use the picks at home, too precious to be lost, lol. Thanks Ming! Me too, no way I am going to send them to school with Nikolai,heheh. A little late to the game, but do you think the Smile stamp is still available somewhere?